If you want to know how do you keep cats from scratching furniture, it is important that you first understand the reasons why cats scratch. That way you will get an idea of exactly what you are dealing with. Cat’s scratching is a vital part of their being, and cats scratch furniture (and other things) for a number of different reasons. Next you should be aware that as a very natural behavior, there will be no way to stop your cat scratching altogether. It is impossible, as it is such an inherent and important part of their make-up. The idea is to divert or redirect the cat’s scratching onto something that it is OK for for your cat to scratch on, something that it is appropriate and will not matter when it becomes subject to the abuse of kitty’s claws. The ideal thing is a cat tree or cat scratching post. A cat scratching tree should be a very solid furniture that has been specifically designed and dedicated to your cat and her scratching habits. It “belongs” solely to your cat. It is her very own place where she can lounge around, sleep, play around on and also where she can flex her muscles. She will use it to dig her claws in deep and generally enjoy a really good stretch. Once you have your cat scratching tree, then the steps to training your cat how to scratch where appropriate are relatively simple. My first point here is to make sure you do not ever hit or otherwise physically punish her if you find your cat is scratching the furniture. By punishing her physically, she may come to fear you and often simply does not understand what it all means. She will be confused. Although she may stop scratching the furniture when you are around, she will most likely continue to do it when you are not around. And a confused cat is more likely to resort to other inappropriate behaviors, too. Some people suggest that you use a spray bottle of water and spray her when your cat is scratching the furniture. Personally, I see this as physical punishment also. It may make your cat fear you, or become nervous as she is suddenly getting a burst of the dreaded water bottle, right at the exact moment when she is enjoying herself the most. I prefer to make it very obvious to her that I do not like what she is doing. I would make a “psst” noise and maybe clap my hands a couple of times. This will just startle her (not frighten or upset her) and she will look to you to see what is wrong. At that point, pick her up, carry her immediately to her cat tree and “hang” or “drape” her from the scratching post. This is how I train my cats to use the cat scratching tree – I show them! If you “drape” them on the cat tree, they can feel the weight of their body hanging from their claws, and they find that it feels really good. It will usually only take a few moments of this and also of encouraging words for her to start pulling and scratching at the scratching pole with her claws. If you have a tall scratching post, this is the best because the cats love it. They can get the whole length of their body involved. A proportion of cats seriously love the herb “Catnip” and this can be used as an attractant. You can get Catnip as a dried herb and place or hang little bags of it around her new cat tree. If your cat is one of those kitties that loves catnip, this will make the retraining go a lot quicker. In some instances, if you have a really determined cat and her furniture scratching habit has been ongoing and is very ingrained in her being, then you might have to temporarily cover the part of the furniture your cat is scratching with something not good to scratch. This could be some plastic, some double sided sticky tape, or even a prickly mat. This will deter her from the furniture long enough for her to build up love of her cat scratching tree, and can be removed as soon as she is re-trained appropriately. Another deterrent can be putting some pieces of orange peel around the object you don’t want her scratching. Orange peel can deter some cats (but not all!). Also, if you keep your cat’s claws trimmed, this will also minimize damage to your furniture. But, if you train your cat to use the cat scratching tree 100% of the time, then you will not have to worry about cat claws damaging furniture. Here is a link to our page on how to trim a cat’s claws. With patience and understanding on your part, training your cat to scratch on the cat tree should progress very quickly and in next to no time you won’t have cats scratching the furniture anymore. So have fun and good luck. 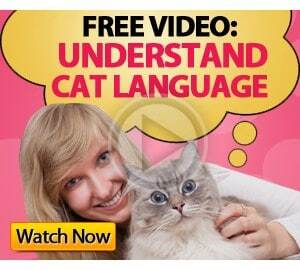 This quick video give some excellent tips for keeping your cat from scratching the furniture. It is short and to the point. Take the time to have a look and you will pick up some really handy tips. Make sure your cat has her very own scratcher – it is the MOST IMPORTANT piece of cat furniture and you need to have one! One with a place to relax and sleep is ideal. That way she always has somewhere to flex her muscles and sharpen her claws – whenever she needs to. Below are some nice, smaller type cat scratchers, if you would like to purchase one. Thanks heaps for the information you provide here. So many great ideas on your website. I am “owned” by seven adult kitties who have the run of the house, and rule with iron paws! But since they are not allowed outdoors they require lots to keep them occupied and entertained so they don’t keep wanting to get outside. I give them lots of cardboard boxes to play with, which they really love. But to date we have not been able to afford to buy a cat scratching post for them. I have bought the book on the plans to build a cat tree and I am sure that they will love the new cat trees that I have got planned for them. This is really interesting inf on cat trees, You are a very skilled blogger. I have joined your rss feed and look forward to seeking more of your wonderful post. Also, I have shared your website in my social networks!